Each generation produces a few great masters of the style who literally make it their life work, often starting from before they could read. Yet all recognizably follow the same tradition. Sonny Chillingworth played for speed, but he didn't play fast only for show, but because that's the way he felt like playing. And it doesn't mean he always played that way. But speedy or sweet, it was always identifiably Sonny's style. Sonny Chillingworth, born on Oahu but raised on Molokai, was of English, Irish, and Hawaiian ancestry. His talents became known as a member of the "Sons of Hawaii," a group that gave a start to many a name entertainer today. A natural musician, Sonny didn't read music nor did he ever have any formal music schooling. He picked up playing slack-key from his grandfather. He composed songs but, in his words, "always in my head, never on paper." 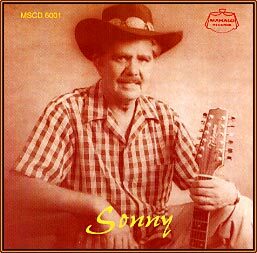 Though Sonny liked to wander once in a while into Portuguese, Mexican, and modern, he always returned to his first, last, and always love � for slack-key was Sonny's way of life. Edwin Bradfield "Sonny" Chillingworth died on August 24, 1994.